I know we come here whole and it is in the experiences that we are given in our life time… here on earth… in these temporal body’s… that are a gift for us to learn as much about this life as we can. Trust You Are Healed is Heaven’s Will. 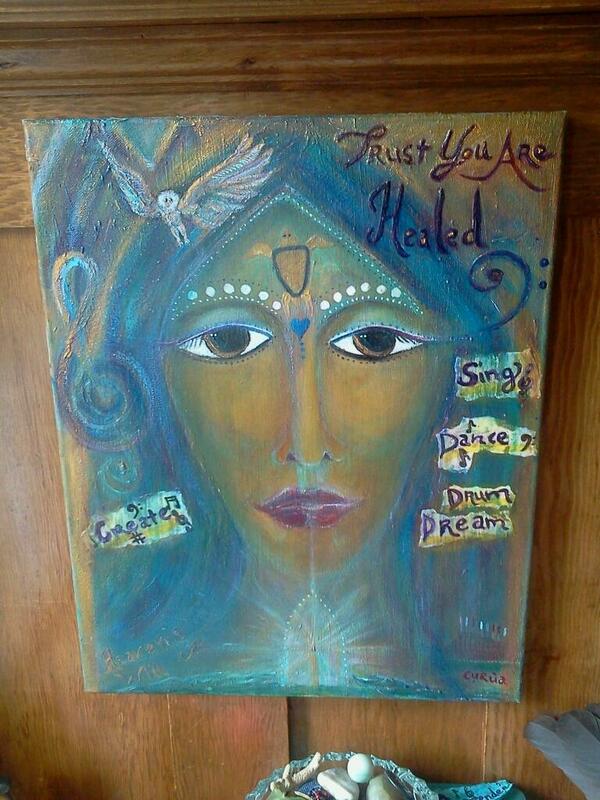 My prescription for my healthy mind, body and soul, is to Create, Sing, Dance, & Dream. Of what I want to do that make me happy, and brings joy into my life… and those around me. 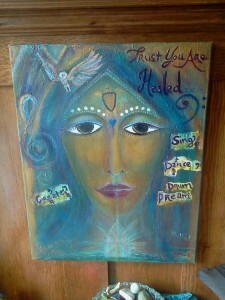 We were asked in the guided meditation to paint the gift we were given. A small Golden Turtle appeared in my hand. I looked it up and found that there was a Golden turtle that lived in the Green Lake and that one day the turtle swam up to the boat of the Emperor and asked for the Magic Sword aka Heaven’s Will. CURUA is it name in Vietnamese meaning “Great ~ Grandfather” It is said that they believe that it is really Great ~ Grandmother because they keep trying to bred her and because of the toxic waste that has been dumped there in the lake, her eggs are infertal. We are polluting our mother earth, and she and her creatures are suffering because of it. We were also asked during the guided meditation to add symbols that mean something to us and help us on our path. Music notes just seem to float in to my consciousness. I have always loved to sing and dance. It brought me great joy throughout my life and I know that it will continue to bring me Joy, as I keep creating the music of my soul. Lastly we were asked to add our pilot light and mine is burning brightly as I share this painting of Love Light and Strength of my inner healer coming out of the shadows letting me know she has been there all along. I want to Thank you Shiloh Sophia and Lissa Rankin for helping me to energetically shift my energy and gifts… that my presence just needed to integrate into actions steps. Guiding and gently moving my energy forward, in such a joyful flow of surrender to the sacred one within. Happy Mothers Days my lovely Red Thread Sisters and Sacred Family of Choice may all your dreams and wishes come true for you today and everyday of your beautiful lives.